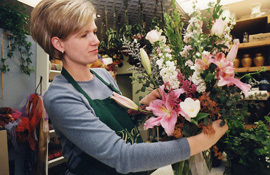 Flowers are among the most common Valentine's Day gifts. Photo Courtesy of U.S. Census Bureau. Photo by Paul Corbin Brown for the U.S. Census Bureau. Valentine’s Day is celebrated annually on February 14th and is associated with love and romance. Valentine’s Day has roots in Greek, Roman, and Christian history. In Greek and Roman times, the month of February was associated with love and fertility. Around 500 AD, the Catholic Church declared February 14th as the day to commemorate at least three different saints (people awarded sacred and holy status after their deaths) named Valentine. The first documented connections between St. Valentine’s Day and romantic love date from fourteenth century England. February 14th was believed to be the day when birds paired off to mate. Lovers exchanged handwritten notes and called each other “valentines.” Today, most people do not focus on the religious aspect of Valentine’s Day. For most Americans, Valentine’s Day is associated with romance. Couples exchange “valentines,” cards with romantic messages. The first commercial Valentine’s Day cards were produced in the 1840s. Today, millions of Valentine’s Day cards are sold. Couples often also exchange gifts of chocolate and roses as tokens of their feelings for one another. As a result, Valentine’s Day is a big business for candy companies, florists, and other businesses that produce romance-themed merchandise for this holiday.